Press Release – Aceblade: The Las Vegas Vigilante Heading to Kickstarter, May 5th! 4th Wall Productions aims to complete its first 4 book comic book arc and collect those stories into a 100 page package for consumers. 10 years of Aceblade development have led to this moment. Aceblade: The Vegas Vigilante is a comic book series that was started just over 10 years ago by two guys who knew nothing about #MakingComics. The first 4 years was spent just developing who Aceblade was and what themes his story would encompass. Revenge, Greed, Personal Courage, and Sacrifice all share corners of Aceblade’s journey to become the Vigilante of Vegas City. On May 5th (2018), we will launch our 4th Kickstarter in attempt to complete the 4th comic book in the series which will complete Aceblade’s origin arc. There will be options for backers to get all 4 books together, as well as just the 4th comic book for those who are caught up to the story already. We are asking for help to raise $1,600 to finish paying for Art and colors for the books, we have already put deposits down to start production and will be taking on the logistical costs ourselves. 80% of the project is already complete, with Aceblade 1-3 already being successfully funded on kickstarter and distributed previously. 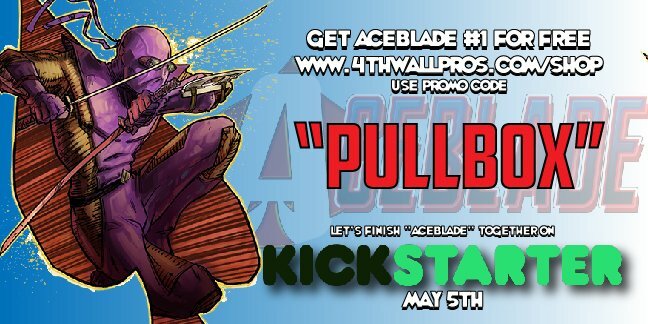 We’ve decided as a promotional item that we would give potential backers the opportunity to download and read a digital version of Aceblade absolutely FREE by using our promo code “PurpleNinja” at checkout after adding Aceblade #1 to their cart. We’ve also reached out to various podcasters and bloggers in the comics space to offer promo codes to their audiences as incentive to check out our Aceblade story. We are planning to attend WICOMICON in Baltimore, MD on April 28th as well as the Free Comic Book Day event at Ultimate Comics in Durham NC to promote the project as well as a few guest spots with podcasters scheduled to run during the campaign. The Kickstarter will launch at 0700 on Saturday, May 5th, 2018 which is also Free Comic Book Day. We will be offering comics, graphic novels, our digital comic catalog, t shirts, CGC graded comics, and much more. Thank you for your help, and consideration. If you would like to see the developing preview page for the kickstarter, please visit www.AcebladeComic.com and if you have any questions or would like to offer assistance in any way please email Danny J Quick at TheAceblade@gmail.com.